Is a VoIP phone service required? The answer is obvious- yes, you need it. However, this is the obvious case only when you want to network across the country, continent and globe! VoIP services help you to connect with your prospects, partners, clients and other stakeholders in no time, at the most affordable rates. Irrespective of the size of your business, type, and other differences, it’s essential to make use of such tools for the most effective and efficient use of time, money and other resources. Isn’t it convenient to make use of smart phones for business or official purposes? Speaking on behalf of a variety of experiences as well as research, it is found that smart phones can be used for official purposes however, it can definitely act as a distractor. Which is why, it’s advised for all business persons to have access to IP phones given by IP phone service providers and make the most out of it. Moreover, when one leaves a company, he shall take his smartphone with him too which can be restricted with such a change. If a company has always used landlines throughout its company’s life, is it okay to switch to VoIP services? Will it negatively affect the company? The fact is that landlines have almost shut down and it makes no sense for a company to make any further investment on such a vain product. With VoIP services in your company, the employees may take some time to adapt depending upon their exposure to VoIP. However, in less than 2 weeks, your company will be back to normal- only better! More importantly, with VoIP services, you can enjoy a variety of smart features like video conferencing, click to call, call forwarding and more in no time, at the most affordable rates. How to determine the best VoIP provider for each company/ your company? A little bit of research and a little bit of review reading shall do the trick for you. Also, you can always fill out the ‘contact us’ form in order to request a quote or know more. 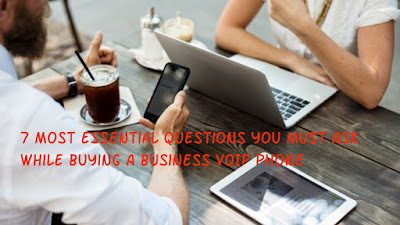 Also, while picking out the right VoIP provider, you need to look out for how complicated it is, whether you have enough bandwidth to afford the service provider, the accessibility aspect and more. Is there are VoIP service provider as convenient to use as a landline? Not many VoIP providers make it convenient enough to be used. However, some VoIP providers like IP Momentum are good. Just in case you need their help with regard to its functionality, just give them a call anytime, anywhere. Which are some of the many VoIP features available, unlike landlines? Missed call notifications and so many more! Can employees away from the location also access the business VoIP phone system? It giving access to employees to VoIP phones anytime is a concern? That is all up to you- Your VoIP provider can always customize your unlimited calling plan which shall determine the accessibility of the information in your IP phone. Remember, if you want to keep a tab on your employees, you can always locate them, record their conversations and spy on them in all the possible ways. In fact, it’s good to give them an IP phone as it ensures professionalism at all points. These are some basic yet, essential questions you need to ask as a company owner. Without these basic questions answered, your company cannot go anywhere towards the success of your brand.